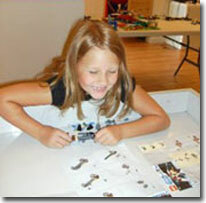 The BRICKS 4 KIDZ model, was founded by Michelle Cote in St. Augustine, FL. Michelle started an after-school Spanish Class (outside the school system). In the Spring of 2008 while filling out the forms to become a "School Board Vendor," teaching Spanish at the school the following school year, Michelle noticed a category (on the form) for "Creative Science." Her son loves to play with Lego® bricks, and she thought to herself…"Maybe I could lead a Creative Science Lego® class too." Michelle was awarded the bid for both the after- school Spanish and the Creative Science Lego® class. That summer Michelle advertised a Spanish Camp and a Lego® Camp. She had 3 children sign up for the Spanish and 35 children sign up for the Lego® camp! After seeing the excitement over the Lego® bricks, Michelle decided to go with the Lego® after-school class in the fall...and it took off. That Fall, Michelle found herself at 3 different elementary schools with an average of 20 students in each class every week. Now, just a year later, Michelle has contracts with 10 schools in the St. Augustine area! In addition to teaching classes at the public schools, Michelle also taught a home school Lego® class during the day while her children were at school. 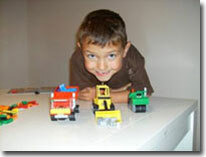 Bricks 4 Kidz provides project-based programs designed to teach principles and methods of engineering to children, ages 3-12, using LEGO® bricks. For many people, the dream of owning their own business is just that - a dream. But it doesn't need to be. With a BRICKS 4 KIDZ franchise you can turn your dream into a reality and be your own boss, create a new career, and begin enjoying the many benefits of business ownership. Lego® is a registered trademark of the LEGO Group of companies which does not sponsor, authorize, or endorse these programs in this ad. This Franchise Is Not Directed To Any Person In Any Of The Following States: CA, CT, HI, IL, IN, LA, MD, ME, MI, MN, NE, NY, ND, RI, SD, VA, WA AND WI, By Or On Behalf Of The Franchiser Or Anyone Acting With The Franchiser's Knowledge. No Franchises Can Be Offered Or Sold In The States Listed Above Until The Offering Has Been Registered And Declared Effective By The Appropriate Regulatory Authority. No Franchises Can Be Offered Or Sold In Any State Unless The Franchise Offering Circular Has Been Delivered To The Offeree Before The Sale Within The Applicable Time Frame. This Franchise Is Offered Only By Delivery Of A Franchise Offering Circular. Click on Request Information button above for FREE information on how to start a Bricks 4 Kidz franchise today! Please Note: Bricks 4 Kidz franchises for sale, and other franchise opportunities, business opportunities, businesses and franchises for sale on this web site are not to be considered as an "offering", "franchise offering", suggestion or recommendation by GlobalBX. The franchises, businesses and business brokers seen on this web site submit their own individual content. This advertisement depends entirely on the truthfulness of the information provided by our advertisers which includes, but is not limited to, franchisers, franchises, franchise brokers, franchise consultants, business sellers and business brokers. As always, GlobalBX recommends that you consult a lawyer, financial consultant, accountant or professional advisor before buying a franchise or business opportunity or any type of business. By submitting this form and requesting more information, you have agreed to all terms and policies of GlobalBX and the business and franchise offerings listed here. Please review our Terms & Conditions for more information.